The last time I made pumpkin pie, I noticed that very little got eaten. I asked why and it seems that most people like the taste of pumpkin, but they don't like the texture of a traditional pumpkin pie. 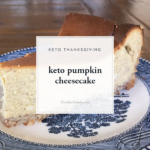 So, why not combine the taste of pumpkin into a traditional cheesecake? 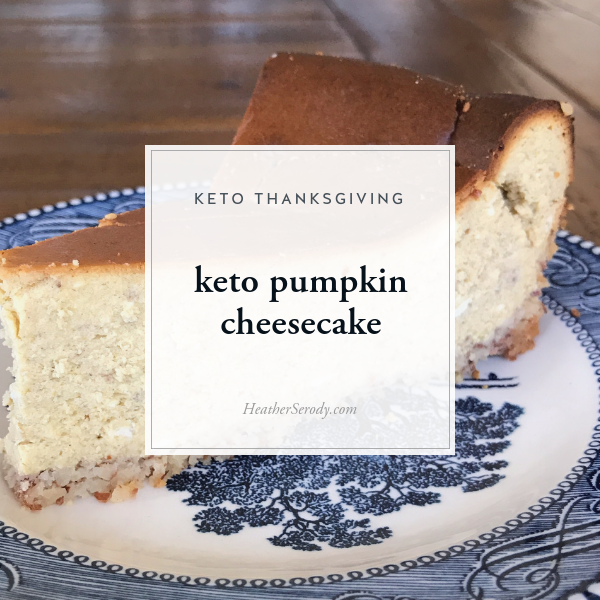 This cheesecake gives you the density, texture, and tang of traditional cheesecake, but with a subtle pumpkin flavor that you crave on Thanksgiving. Like any cheesecake, this is a calorie-dense decadent dessert, so I advise to slice your cheesecake into 12 slices. The best news is that there are only 7 total carbs per slice! 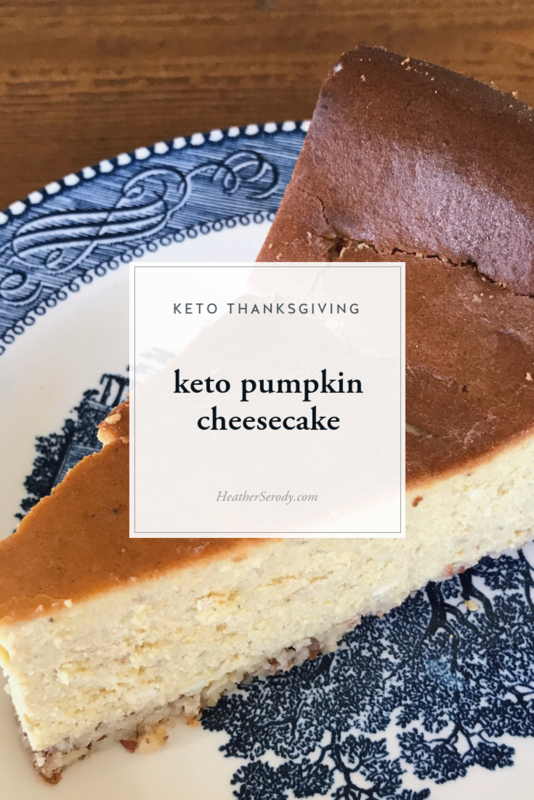 A traditional pumpkin cheesecake has 45 grams of carbs per slice, which means making your cheesecake low carb this year you save yourself 38 grams of carbs AND you get to enjoy a super yummy Thanksgiving dessert. Make sure that all of your filling ingredients are room temperature, or it will be impossible to mix properly. Always set a dish of hot water on the bottom rack & set the cheesecake on a sheet pan above to bake. Otherwise, the top of your cheesecake will crack and that's just a sad sight. Make your cheesecake an absolute minimum of 24 hours prior to eating. Cheesecakes demand 5 hours to make, bake & completely cool, plus an overnight to chill in the refrigerator. But don't let that scare you, it really is easy to make! *If you are grinding your own pecans, place them in a food processor and grind until they resemble coarse crumbs, then measure out 2 C.
Grease bottom & sides of the springform pan with 1 TBS. butter. In a medium-sized bowl, mix pecans with Swerve, egg white, salt & vanilla until combined. Press firmly into the bottom and a little up the sides of 9" springform pan. Cream the cream cheese, pumpkin puree, Swerve, eggs, egg yolks, sour cream, pumpkin pie spice, lemon zest, and vanilla in the bowl of an electric stand mixer fitted with a paddle attachment (or use a handheld mixer) on medium-high speed until completely smooth. Pour into nut crust. Smooth top with a spatula. Place a pan of hot water in the bottom of the oven to keep the cake from cracking. Don't skip this step or your gorgeous cheesecake will crack right across the top. Bake at 4ooº for 20 minutes. The cheesecake will turn golden and puff. Reduce heat to 275ºF and bake 1 hour & 20 minutes longer, or until it is set on the edges but it may still be a little jiggly in the center when you gently shake the pan. This is okay, it will set as it cools. Take the cake out of the oven and allow it to come to room temperature for another 2 to 3 hours or until completely cooled. Cheesecake will deflate. Leave the cheesecake in the springform pan, wrap tightly with plastic wrap and refrigerate overnight. ** Do not skip this step! Cheesecake must be allowed to chill at least 8 hours for the flavors and texture to come together. When you're ready to eat the cake remove it from the refrigerator and let it sit for at least 10 minutes. To release it from the springform pan, run a hot knife around the outside of the cake. Leave the cake on the bottom of the springform pan for serving. Cut into 12 slices. Optional: serve with whipped cream.